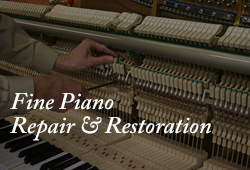 A communication channel of Classic Pianos. Welcome to Around the Piano! 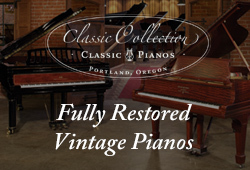 Classic Pianos is using a new multimedia format to communicate our "Passion for Pianos" with a larger audience—bringing you podcasts, videos, slideshows, as well as the written word. In this and future editions we will spotlight locally and nationally-recognized performing artists, feature interviews with fascinating people in the industry, promote meaningful community events, share the latest developments in the piano-manufacturing world and highlight some of the interesting current activities at Classic Pianos. Our goal is to open doors for a higher-level of music discovery by sharing our "Passion for Pianos" in this way. We hope you enjoy your experience Around The Piano! Is the myth of the starving musician a concept of the past? Dr. Jill Timmons answered that question and illuminated new pathways for musicians during a recent conversation with Around The Piano. Listen to what great artists are saying: Dr. Timmons Interview Dr. Timmons' fresh perspective on the opportunities for today's "musician-entrepreneur" reaches well-beyond the music industry. 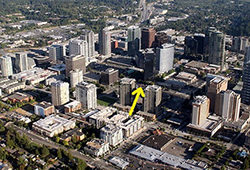 By the way, tell us the name of her publishing house and be automatically entered to win a copy of her special title. 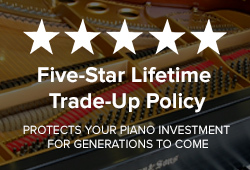 After nineteen years of research and development, Yamaha has introduced a new line of pianos that has had a profound impact on the artistic community. Every year on March 21, Johann Sebastian Bach's birthday, musicians celebrate Bach in the Subways Day by offering free performances of Bach's music in subways and public spaces around the world. Bach In The Subways November is Disklavier Month. We are offering huge incentives this month to all customers who purchase new Disklaviers. The Disklavier is a piano that combines tradition with technology in a way that has changed the way people think about what a piano can do. It is, first and foremost, a traditional piano Be the first to know how you can buy and download the first Around The Piano Christmas Live. One hundred percent of the proceeds will go to the Snowman Foundation. If you don't want to receive any more emails from us, you can click here to unsubscribe.